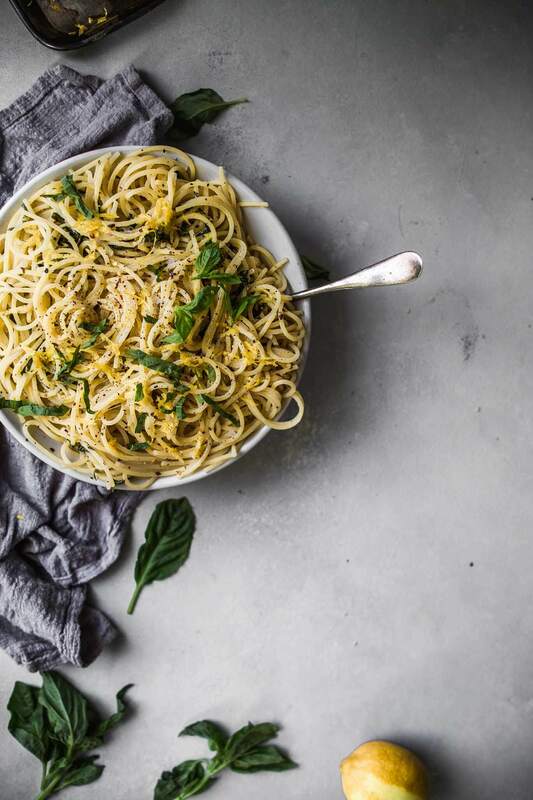 This Pasta Alla Vodka recipe is a definite keeper. 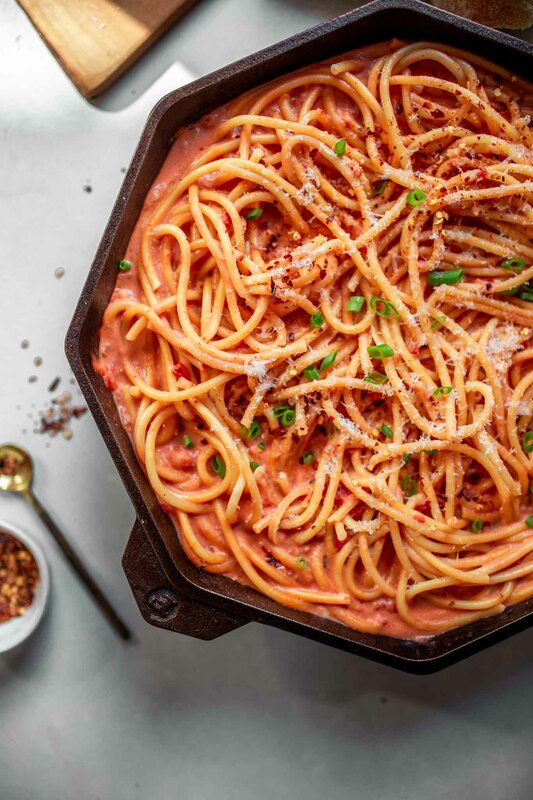 Pasta tossed in a tomato-vodka sauce that’s deliciously creamy & kicked up with red pepper flakes. Looking for a quick & tasty weekend dinner? 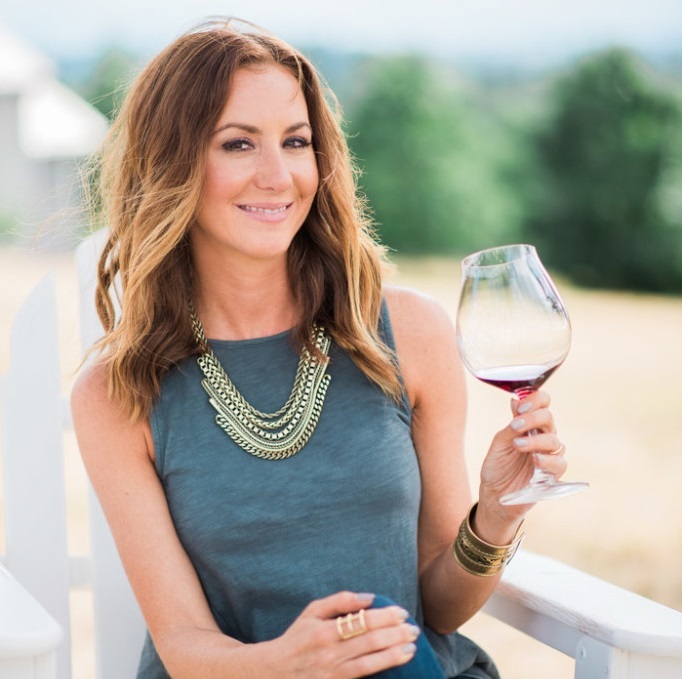 Looking for the perfect meal for date night? Want a dish with a little zing to it? Then this Penne Alla Vodka is for you! 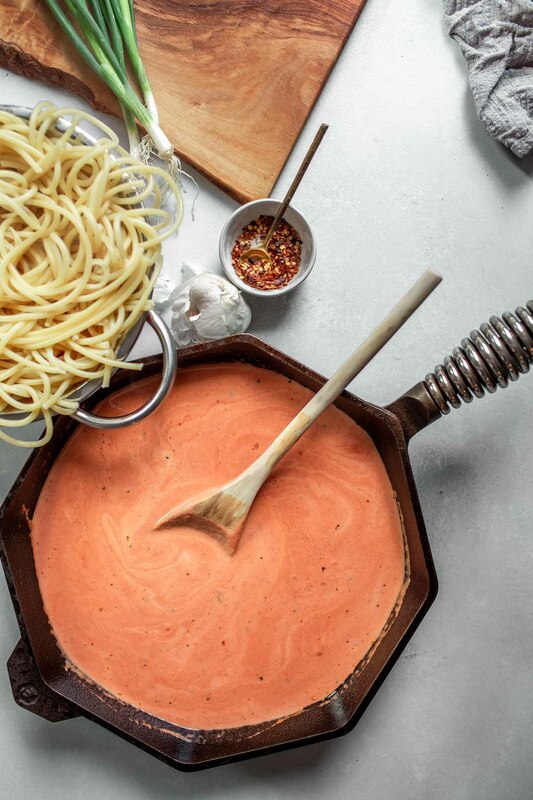 Have you ever tried a vodka sauce before? It’s a creamy sauce – getting that from the heavy cream and parmesan cheese that are swirled through it. However, it’s less rich than an alfredo sauce. The addition of tomatoes lightens it up a bit and the red pepper flakes give it a nice bite. And the vodka? It’s said that the vodka’s function is to release the acids and flavors in the tomatoes. It sweetens them up a bit and enhances the heavy cream and parmesan cheese, lightening them up just a bit and giving a nice bite to the sauce. 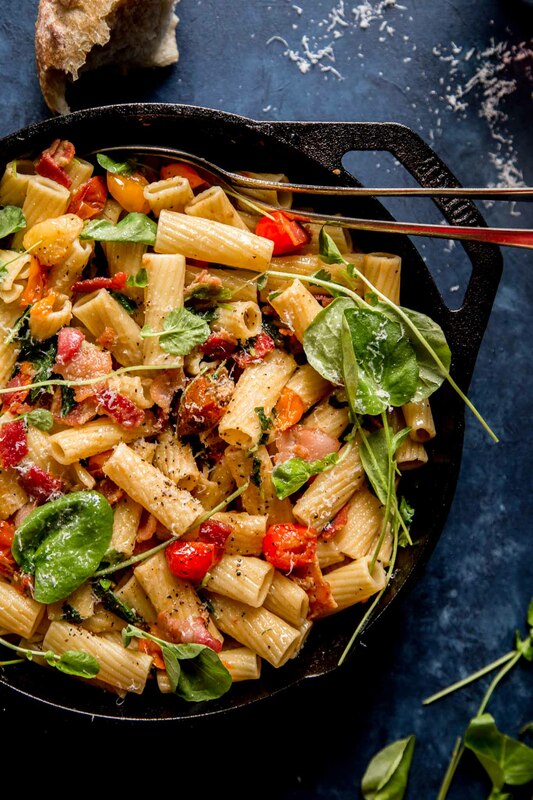 At the end, when I’ve plated my dish, I also love to drizzle on some good-quality olive oil to enhance the richness of the Pasta Alla Vodka even more and to add an extra element to this dish. It’s a little thing that doesn’t take any additional time or ingredients, but really does enhance the dish. And if you’re having company over, you can impress them with this simple step. 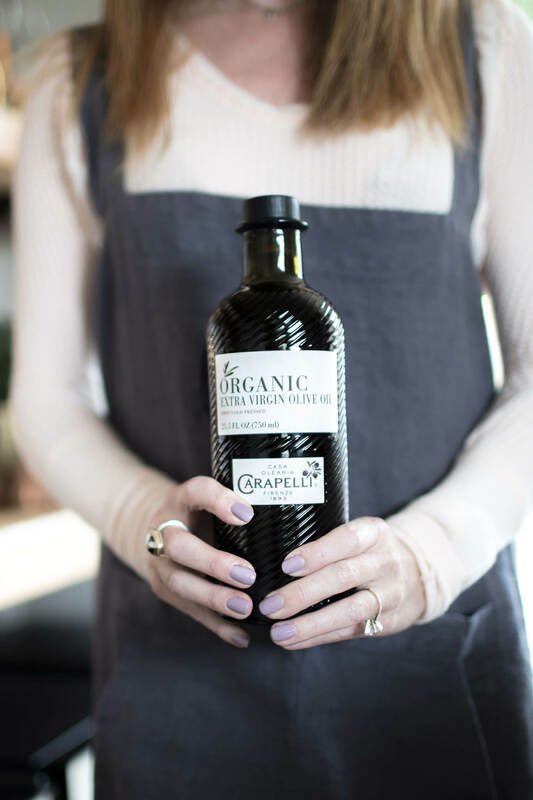 Carapelli Olive Oil is a brand that I’ve recently fallen in love with. Even though they’ve been producing olive oil since 1893, I just discovered them… drawn in first by the beautiful bottle that it comes in. I love that it’s pretty enough to just keep it on my countertop, and I really appreciate its functional pour spout that’s built in to the bottle. But then I also came to understand just how superior its flavor is. 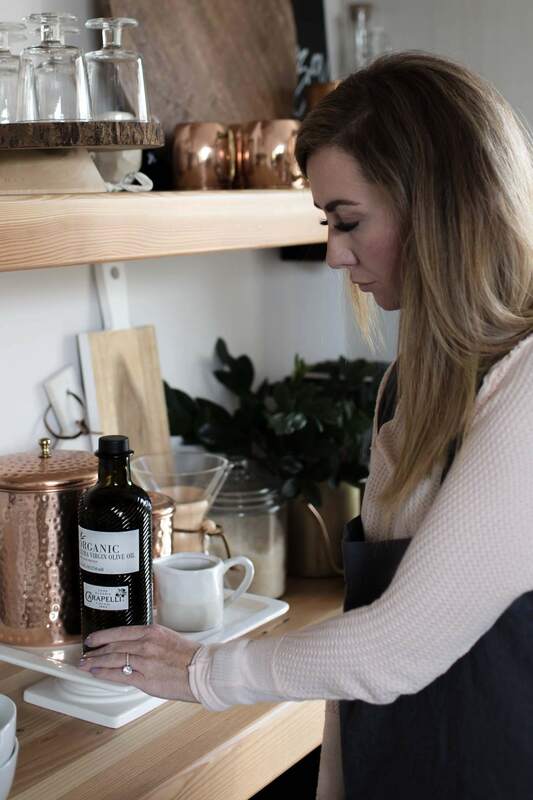 Their Organic Extra Virgin Olive Oil reminds me of a bottle of olive oil that we picked up on our trip to Italy last year – with a lovely bite of acidity, pretty green flavors, and a delicate olive flavor. Unfortunately, we went through that bottle in just a couple months, but I’ve found the Carapelli brand to be a great replacement. Carapelli Olive Oil offers exquisite flavor with high-quality olives nurtured by nature, selected at the optimal harvest time and handled in the most delicate way. Its flavor is soft, balanced, and fruity, with a touch of apple and almonds. Plus, you can also get it on Amazon! Always a bonus in my book – making the most of our Prime membership. Does Vodka Sauce Taste Like Vodka? You will not taste the vodka in this dish. While vodka is nearly odorless and flavorless to begin with, the alcohol burns off even more in this sauce. It’s used as a flavor enhancer, not a flavor distractor. What Can I Substitute for Vodka? If you don’t have any vodka on hand, you can swap in some white wine in a pinch. The finished sauce won’t have quite the same bite to it, but it will still be tasty. Don’t want to use any alcohol at all? You can leave the alcohol out entirely and will still have a creamy tomato sauce that’s delicious. To resemble the same bite that the sauce would have from the vodka, you may want to swirl in a tablespoon of balsamic vinegar when the sauce is finished, to give that extra layer of flavor. How Do You Make Vodka Cream Sauce? 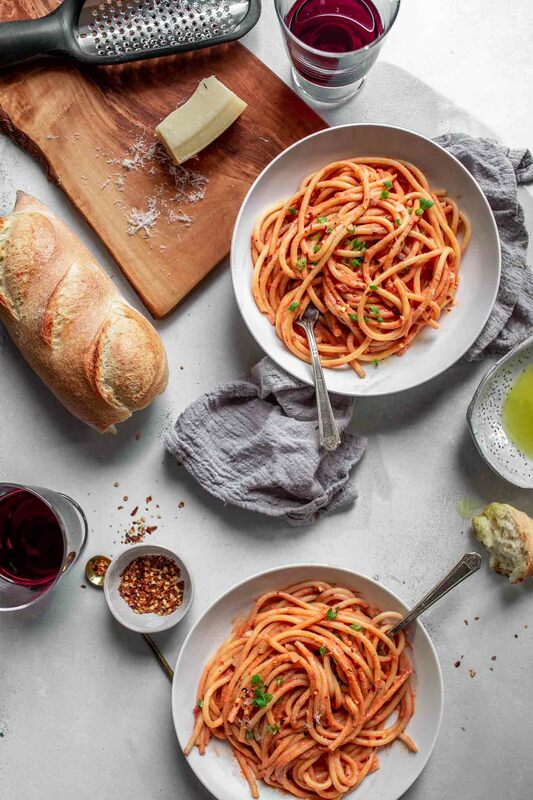 What Should I Serve with Pasta Alla Vodka? I like to serve this creamy pasta with vodka sauce with a salad that’s got a good bit of acidity to it. Two of my favorites are this arugula salad and this fennel & celery salad. If you’d like to add more protein to your dinner, you can also grill up a couple chicken breasts to top your pasta with. If you loved this Pasta Alla Vodka I would appreciate it so much if you would give this recipe a star review! Also, be sure to snap a picture of your finished dish and share it with me on Instagram using the hashtag #platingsandpairings and tagging me @platingsandpairings. This Pasta Alla Vodka recipe will be a definite keeper. 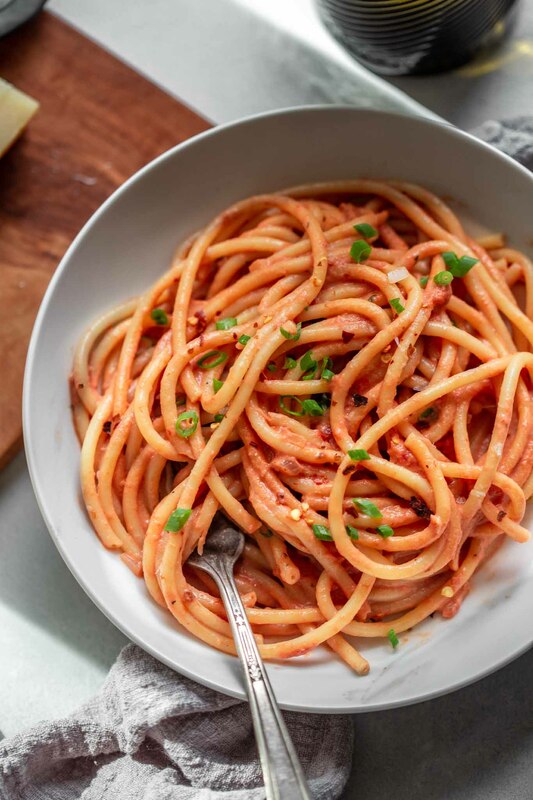 Pasta is tossed in a tomato vodka sauce that's deliciously creamy and kicked up with a sprinkling of red pepper flakes. Meanwhile, heat the olive oil and butter in a large skillet over medium-high heat. Add shallots and garlic, and cook for 3-5 minutes, until softened. Pour in vodka and reduce by half, about 2-3 minutes. Add in crushed tomatoes, bring to boil and reduce to a simmer. While sauce simmers, add your pasta to the boiling water and cook until al dente. 1 - 2 minutes less than called for on the package directions. Drain, reserving 1 cup of pasta water. To your sauce, add the heavy cream, parmesan cheese, red pepper flakes, and salt and pepper to taste. Add the pasta and stir to combine. Add pasta water, if needed, to thin the sauce a bit. Top with chopped green onions and additional parmesan cheese, if desired. Drizzle with olive oil to finish. Sangiovese – This bright and fruity Italian red wine has a slight acidity and pairs nicely with the creamy sauce. Sauvignon Blanc – Its high acidity and citrus quality are a nice contrast to the richness of this dish. Looks delicious!! What font is that, btw? I love it! Really Felix? I think about vodka for lunch quite often 😉 Enjoy!! !